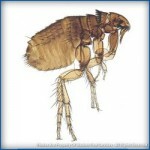 Education and early detection are critical steps in preventing flea infestations. A flea-infested dog or cat can introduce hundreds of new flea eggs into a home each day, leading to enormous flea populations. Once a home becomes infested, control can be challenging, time-consuming and expensive. pets spend a lot of time. If you have a flea infestation, don’t wait. Call us today at 1-888-997-3312 and ask about our comprehensive HomeCare Green Program that controls 60 unwanted pests in your home, including fleas.